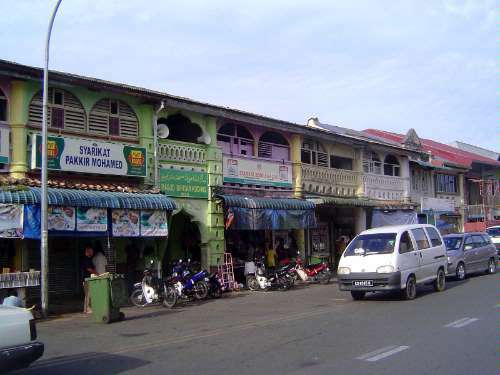 Since the arrival of James Brooke, Kuching has been socially diverse, which is why the central bazaar is punctuated by temples, mosques, and churches. 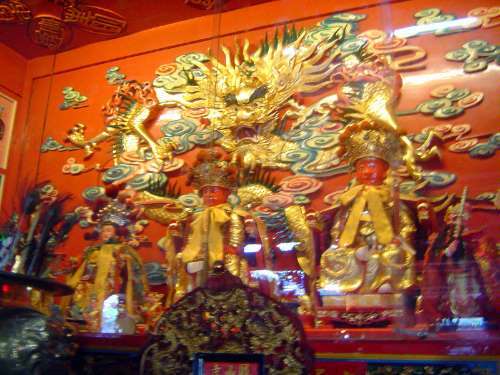 The main Chinese temple is called Hong San Si. It was built no later than 1848 but was rebuilt in 1897, 1985, and 2003. Step inside? 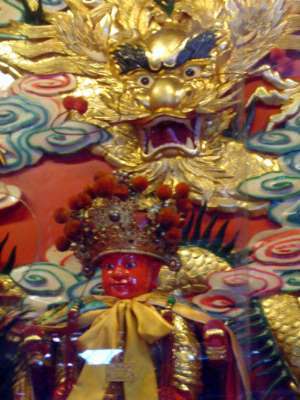 The host deity is Kong Teck Choon Ong, who hails from southern Fujian. The story is that he began as a poor villager named Kuo Chung Fook. He became a geomancer and, aged 16, climbed a tree where he chose to die. Miracles followed: epidemics ended, floods were prevented. His childish image is carried around the city on his birthday, the twenty-second day of the second lunar month. 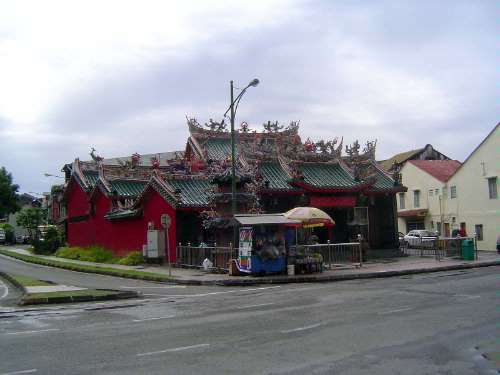 The main Malay mosque was rebuilt in 1967 and replaced one from 1847. 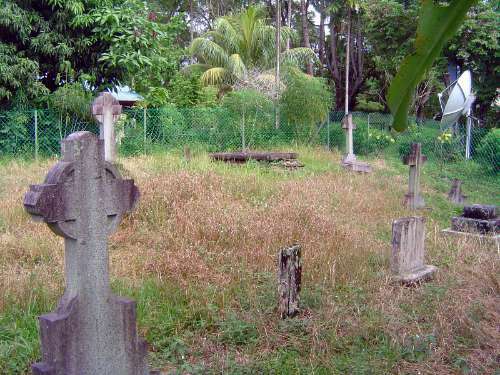 Many of the tombstones appear to predate the rebuilt version. 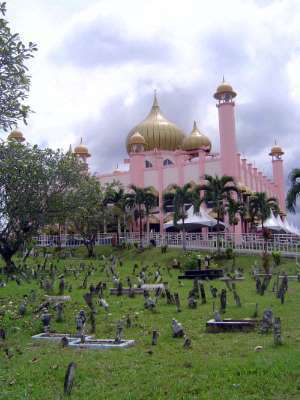 There's an Indian mosque, too, the Masjid Bandar Kuching, entered through the green doorway. 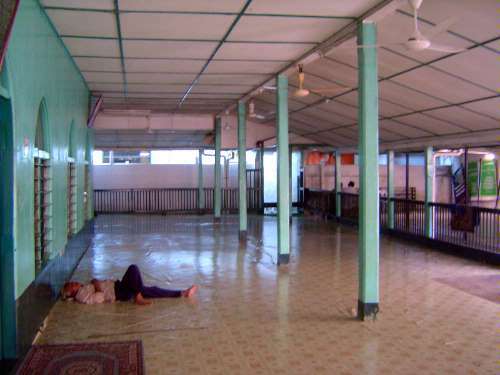 The prayer area, deep within a block of shophouses. 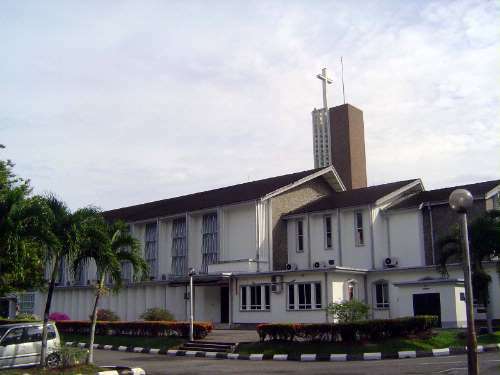 The St. Thomas Church was rebuilt in 1956 and replaced a structure from 1847. 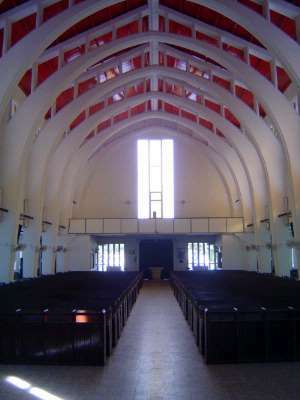 The original church was built by a German carpenter and was a marvel in unpainted wood. Perfectly shaped columns supported Gothic arches wrapping the nave and supporting upper walls of wood with lancet clerestory windows. 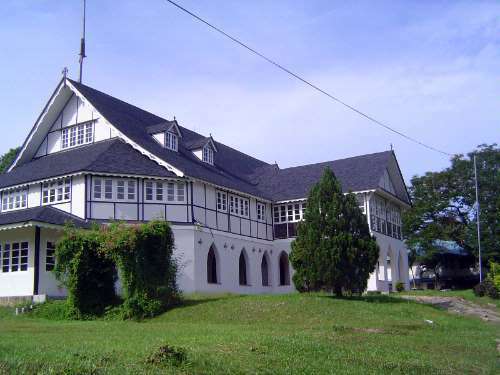 The original church fittings were partially salvaged and recycled into the Church of the Holy Cross at Sungai Tanju, east of Kuching. Near the church, the so-called Bishop's House was originally a Chinese-owned private home. It later became a boarding school and is now the diocesan center. The first Bishop of Kuching, by the way, was James McDougall, chosen by James Brooke probably because McDougall was also a surgeon. 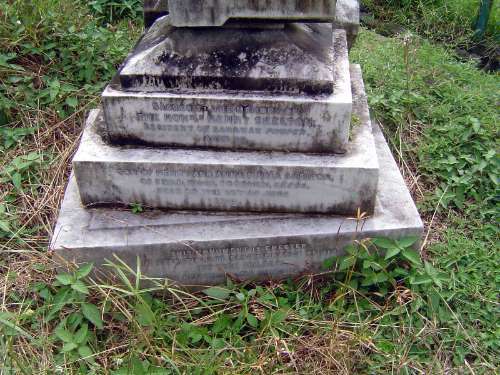 McDougall stayed in Sarawak for 20 years but returned to England in failing health in 1868. He recovered enough to serve later as bishop of Ely and, later still, Winchester. 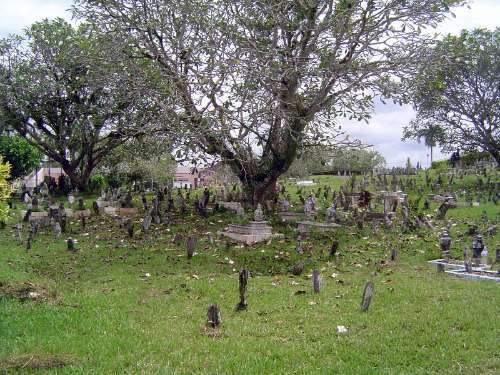 There are several Christian cemeteries in Kuching, but this is the oldest, on the edge of the church grounds and across a street from the main bazaar. 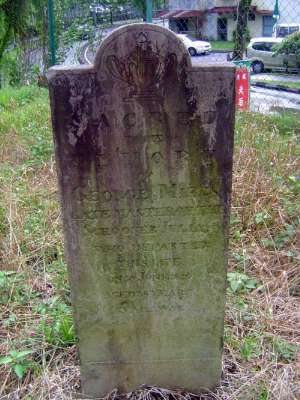 The broken gravestone of Henry Skelton, who died, aged 30, two months after his appointment by Brooke as Resident of Kuching (here called Sarawak Proper). The cause of death was listed as "dynamic and intermittent fever." Master of the schooner Julia, 1846. 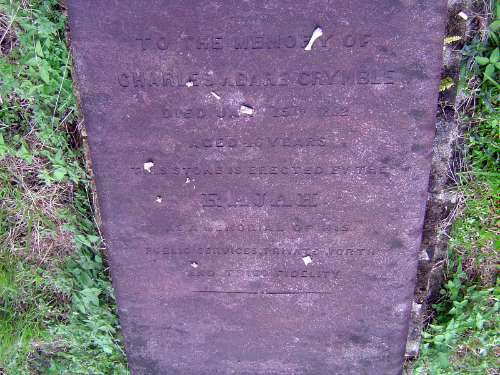 "...erected by the rajah as a memorial of his public services, private worth and tried fidelity." 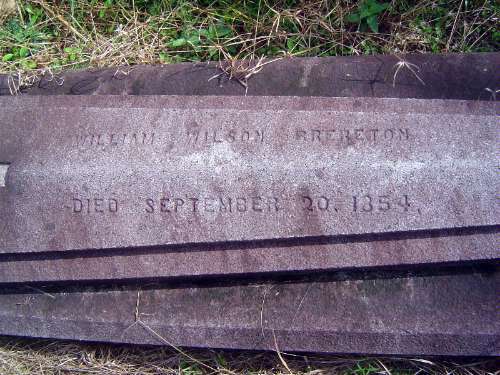 Brereton was ambushed near Skrang, lost a colleague in that attack, and survived only to be soon killed by dysentery. He had been in the country six years. 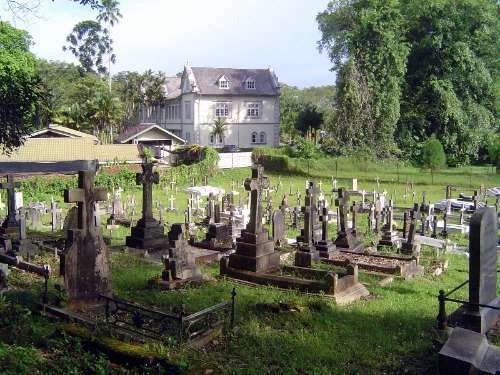 Catholic cemetery, with school in background.